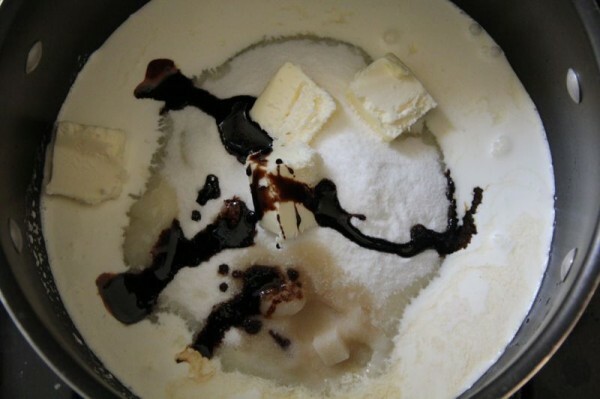 I know I’ve mentioned this recently, but there are definitely recipes that I’m not drawn to. It’s that way with any cookbook, for any cook and/or baker. Maybe that’s a bold statement. Maybe there’s someone who is excited about every single recipe in a particular cookbook. But, I don’t think so. Whoever you are, I think you’re lying. That’s right, I just called you a liar. I just don’t think a person can have a genuine equal excitement about every recipe in a cookbook. Actually, that’s more what I’m getting at. There’s not an equal excitement for every recipe. 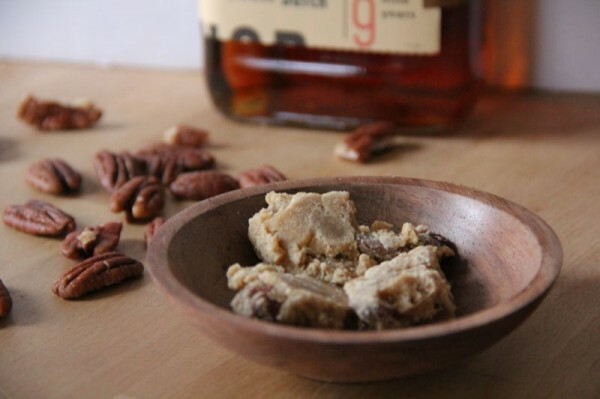 For me, the only connection I’ve had with pralines was with the freezer-burnt ice cream in my Grandma’s freezer. So I think it makes sense that I wasn’t bursting at the seams to whip up these nutty confections. 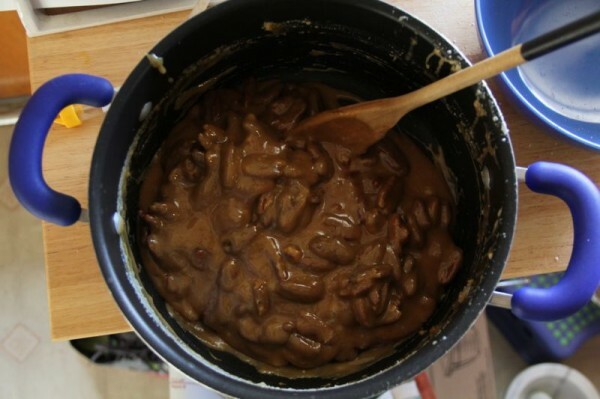 I was easily won over at the beginning, when you put all the ingredients (save the pecans) into the sauce pan at once. So simple! Yes, that’s a spoon. 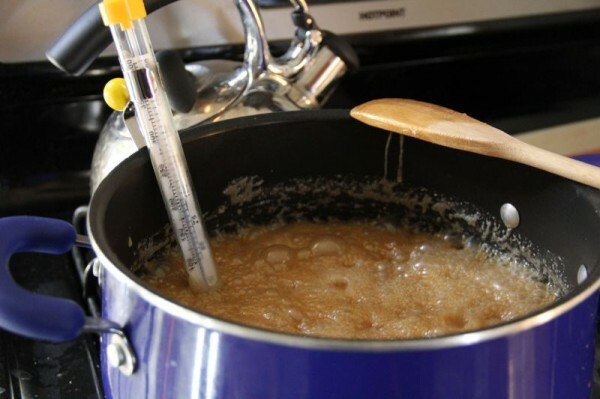 Stirring sugar means it crystallizes, which is something you really want to avoid when cooking sugar in things like caramel. 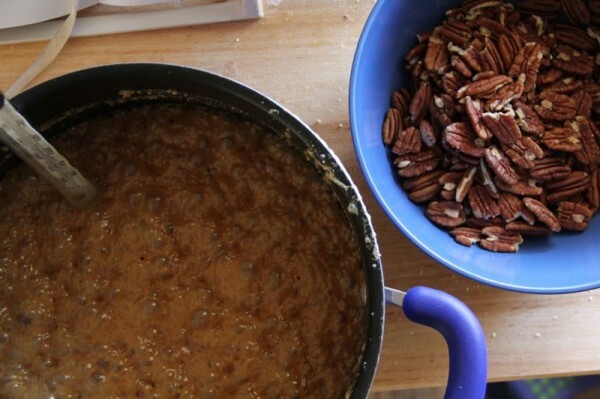 But, you occasionally use that spoon when making pralines because you want it to crystallize. It just felt wrong using that spoon. In the time it took to take one photo, it was already close to completely solidified! When the directions say work quickly, I need to follow said directions. No time for quick snap shots! So, I was left with a thick pile of pralines. Is it strange that the only thing to relieve my anxiety about these pralines was to Google pralines? Instant gratification and a confidence boost. 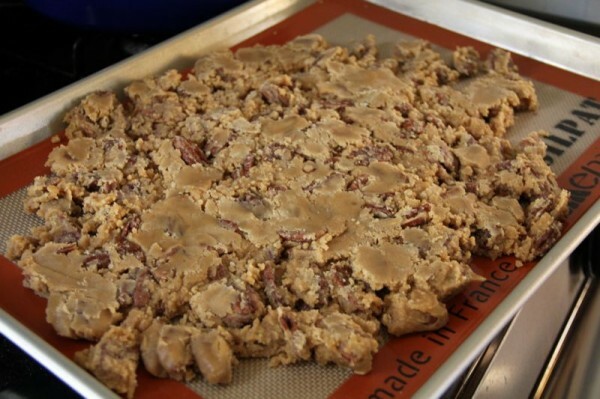 Yes, these visually pass as pralines even though I didn’t go with the classic three inch rounds method. Mine lean towards looking dry, rather than the more appealing glossy look that most pralines have. It’s definitely because I wasn’t working as quickly as I should’ve been. And, never shy to cast blame somewhere else (that’s a joke! ), the greatest fault lies with my thermometer (not a joke!). It was acting strangely the whole time! There was condensation inside the thermometer (that doesn’t seem right! ), and it was dropping and rising suddenly the whole time. Weird, right? I don’t know, they seem to taste just fine – they’re perfectly bourbony and buttery. And, very sweet, of course. I need to go find a grandparent of some sort on the street for some true and honest taste testing! Oh man, is that Knob Creek in the background? That’s the stuff! I have a great candy thermometer from Crate and Barrel. It’s huge and heavy duty and it works like a charm. Check it out if you’re looking for a new one!